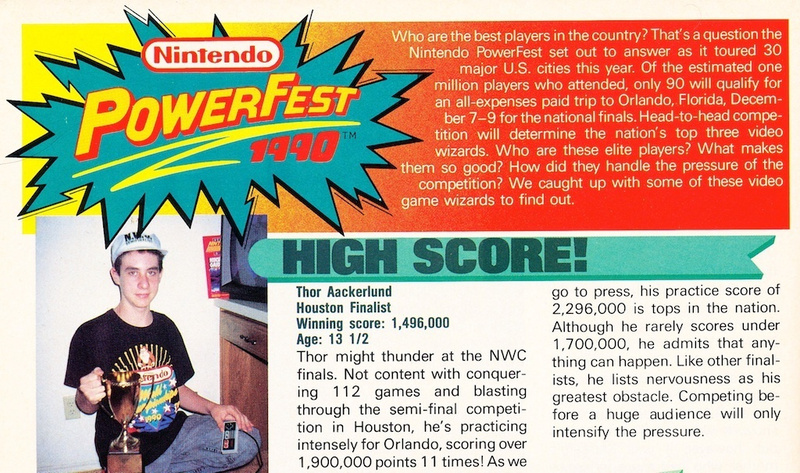 Way back in 1990, Thor Aackerlund saw off all challengers to secure the Nintendo World Championships in the 12-17 category. Now, over twenty years later, he's selling his one of a kind trophy on eBay for an eye-watering $300,000. Just in case you're thinking that figure is a little high, it should also be noted that included in the auction is the actual controller Aackerlund used to win the contest. The NWC (Nintendo World Championship) contest stands easily as the largest video game contest in history, filling the largest convention halls in cities from coast to coast. It went on for 9 long months traveling the country before culminating at Universal Studios in Hollywood, California. At the finals the grand prize was a car, a TV, a savings bond, and the golden Mario statue itself. The various Nintendo World Championship memorabilia has attracted a lot of attention over the years, continually becoming more sought after as the pinnacle not just of NES collecting, but in the entire game collecting and media communities. 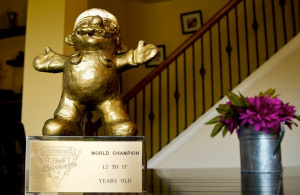 The gold Mario itself is the rarest and highest-profile of the NWC collectibles. There were a little over two dozen Gold NWC carts given away through the random Nintendo Power drawing. Perhaps half of the NWC grey carts, of which 90 were given away, have surfaced over the years. 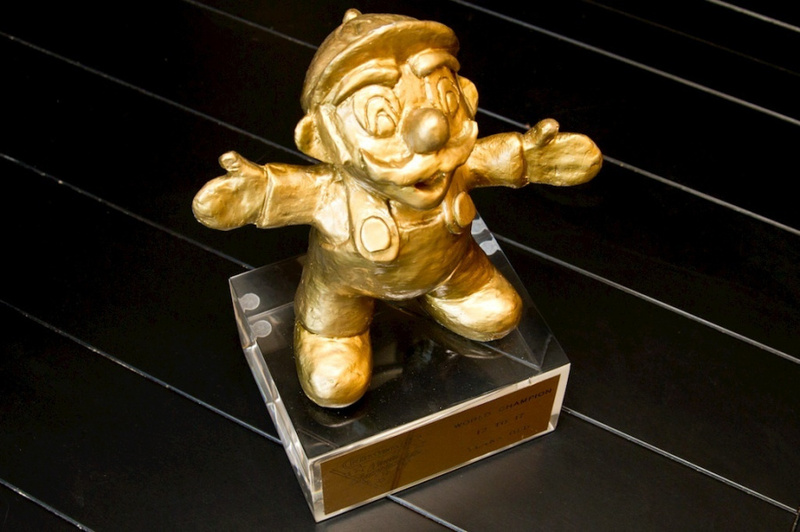 Of the Mario statues, there are three second-place silver ones for the runner-ups in three age categories, and three gold, one for each of the three age categories. I won the final run-off with the 11-and-under and 18-and-up winners and can hold the 12-17 gold overall trophy as the highest award in any organized game contest. None of the other Mario trophies have surfaced, and the grand prize trophy itself is definitely one of a kind. A clipping from 1990. Nice hat! "Oh my goodness, Oh my Damn!" This should have been our reward for 1,000,000,000 coins in NSMB2 not some stupid title screen!!! Wait, why is he selling it though? that trophy looks like it was made out of clay in someone's garage, then spraypainted gold. That being said, I'd still buy it if I had 300 grand. @TheN64Dude But...a gold Mario statue IS our one million coin reward! If that's not the ugliest Mario statue I've ever seen, I don't know what is. I think the real story here is that this guy's name is Thor. Why is Mario wearing oven mitts? Ugh, poor Mario. He doesn't look very good there. That face is the stuff of nightmares. Maybe he got microwaved too? That Mario statue looks more like a gold garden gnome! Wow, that'd be a nice piece of VG history for someone with the cash! That kid in the picture is my garbage man!!! is Mario wearing a Golfing hat? Thor, Son of Odin, thou chargest too much for thine treasure. Hmmmm... Let me just get out my checkbook... Hmmmm... Will an I.O.U. note do? This was a cool article, I enjoyed the vid as well. I don't even get this. Did he play and win loads of games to get it? Or is that high score for super mario world? P4G Solid Gold Edition is cheaper. And it's not ugly. My local Game-X-Chane is trying to sell a huge Mario statute for $300. Add a can of gold spraypaint from Lowes or Home Depot, and you're looking at a total investment of $305 +tax instead of $300 grand. poor, poor deformed mario, he wants someone to put him out of his misery, but a nice piece of gaming history. @TheN64Dude Thanks for the spoiler. You know not all of us have reached that mark yet and I was really looking forward to finding out for myself. Just to echo what other people have already said...that is a hideous trophy. 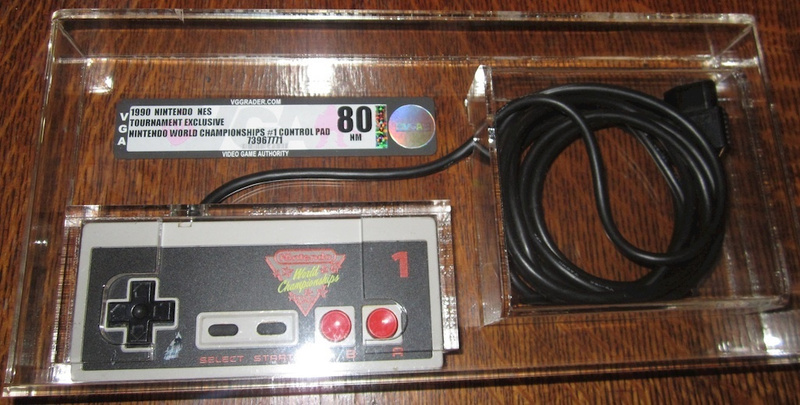 And I need an NES controller like I need another hole in my head. Actually, financing this item would be easy. I can pick up 100 Grand in chocolate bullion at a convenience store for a buck. Pick up three of these coveted bars and exchange them for 300 Grand in gold bullion, then cash it in for a single gold Mario, easy money. Or, I could just eat the 100 Grad bars instead! it looks ugly at best. they really screwed the mario statue. look at the hands !!! my 7 y.o daughter could have done better ! anyway...dont waste your precious money on this give it to me instead, ill start a small company and give employment to people. Does anyone know why hes selling it? If it was me I would never sell something like that. I still have baseball and soccer trophies not to mention two medals I won in some martial arts tournaments. I dont know maybe I am odd like that. i can hear my brother now... "mom, can we sell the house?" It happens. I don't think that he even thought about that when he posted.